There can be little doubt that investing in a conservatory for your home can be a great move. 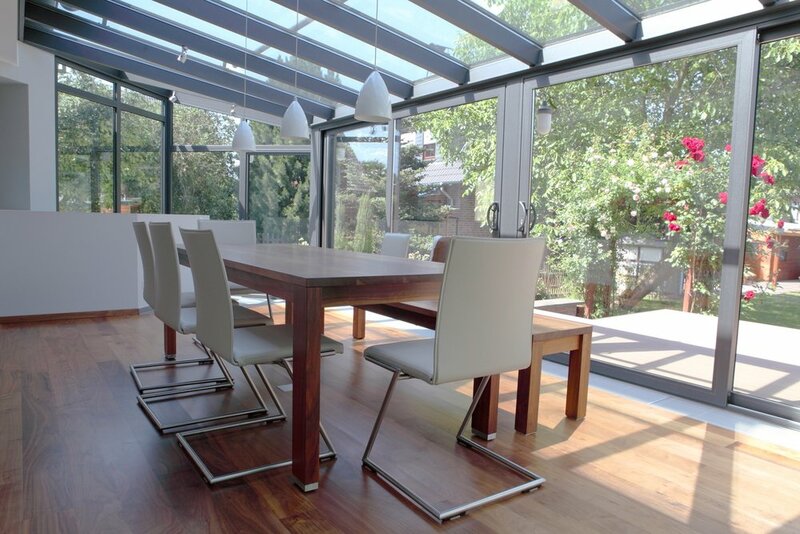 A conservatory will be able to extend your lounge, give you a new dinning room or even be able to function as an office. Not only will a conservatory give you much needed extra space and light but will also increase the value of your property too. If you are thinking about getting yourself a new conservatory then below are a few things to consider before taking the plunge. The fist thing to consider when buying a conservatory is its location. The vast majority of conservatories are located at the back of houses. However, there is no hard and fast rule for this. Indeed, a conservatory might look better on the side of your house, or even at the front. This will very much depend on which way the conservatory is facing and, of course, it is usually best to have it facing south to maximise the sunlight. Do bear in mind though, that if the conservatory is to be visible from a public highway then you might well need planning permission first before you go ahead. Whilst conservatories are great in the spring and summer months a lot of people don’t think about what they will be like during the cold winter months. An inadequately heated conservatory will effectively mean that it becomes a no-go zone during the winter and this will also probably mean that it could become prone to condensation and perhaps even mould growth. To prevent this and give yourself a space that you can use the whole year round it is very important that you think about installing an efficient heating system. A lot of people tend to skimp on this and use a portable heater. However these tend not to be very effective so it is well worth while incorporating a radiator into the overall cost of your new conservatory. Whilst this may be relatively costly you will soon be able to reap the rewards with an attractive (and warm) space that you can use all year long. An effective alternative to having a radiator installed is to go with under-floor heating which will free up the wall space where a radiator would normally go. Perhaps the next thing to consider when buying a conservatory is the style. These days there a range of different and attractive styles to choose from. You may wish to go for a period looking conservatory such as the Victorian or the Edwardian. Alternatively you may prefer a more contemporary style. Whilst there are no hard and fast rules about this it is important to think about whether the look of the conservatory will be sympathetic to the style of your house. For instance if your house already has white UPVC windows then go for a white UPVC conservatory. Perhaps the most important thing to consider with your new conservatory is how usable it will be. Many people can find themselves stuck with a conservatory that is often too hot in summer and too cold in winter. As a result they find that their new space is hardly used at all. Again take advice from a range of installers about both its location and heating options. To reduce heat you might want to consider blinds. Whilst these can often be stylish they will also unfortunately block out a lot of light which defeats the whole point of having a conservatory in the first place. Blinds can also be quite costly too. To help keep the conservatory warmer in winter then it is worth thinking about having insulation installed to increase its usability. Why not consider having insulating slate roof tiles installed that will make your conservatory as warm as the rest of your house making it feel less like an extension and more like an integral part of your living space. Slate tiles will also significantly dampen down any annoying noise, for instance when it rains on the roof. Ultimately, however, it is always wise to ask around and inquire from a number of reputable conservatory installers. Buying a conservatory is a big step and is best to be armed with as much information as possible before you go ahead and buy.